Recently we had a baptism at church. Not an unusual occurrence but, as is typical of a baptism, we had lots of guests, all dressed up in fancy hats and ties. My church is a real “churchy” church — with smells and bells, stained glass windows, candles, pipe organ — the whole ecclesiastical works. We worship together in a traditional way and love the deep mysteries of the spiritual life. However, the congregation tends to be, um, “very comfortable” in the pews. Kids amble up the aisle to see what’s up with the organist (his is the most interesting job there), or stand at the steps up to the rail to say hello to friends. Teenagers cluster up in the back, trying not to be seen, wearing typical teenager duds. You may see someone in their “Sunday best,” or dressed for the beach. For all we know, our pastor celebrates the service barefooted under her beautiful brocade vestments. For this particular baptismal service, my friend Bob was running late and came into church after the service had started. I turned to see him coming down the aisle in his usual attire — whatever was clean that morning. Bob pours concrete for a living and doesn’t trouble himself to distinguish between work clothes versus church clothes. Bob’s hair was unruly, he was sunburnt, his hands were rough and his clothes were those of a man who works hard for a living. The looks on our guests’ faces as Bob made his way down the aisle were something to see. The internal struggle between people’s comfortable lives and the question of how to respond to someone dressed like Bob — whom they assumed to be something other than he is — was both comical and pathetic. Eventually our guests realized that Bob is a beloved member of the congregation. Of course we all have to deal with the same emotions. We struggle with how to respond to people who appear quite different from ourselves. How do we respond respectfully? How can we learn to understand their perspective without asking rude or intrusive questions? When I told Bob what I had observed, he enjoyed a laugh at the discomfort he’d caused. He hadn’t considered it, but was cheered by my concept that by simply being himself, he could help others adjust preconceived notions about first impressions. 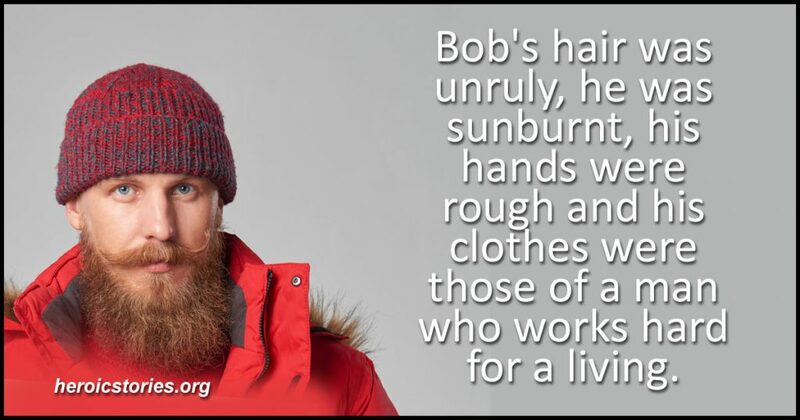 Bob is comfortable enough to come to church dressed like a homeless person. Bob’s ministry among us is not necessarily to comfort the afflicted, but to afflict the comfortable. Thanks for re-running that one! I haven’t seen Bob at church lately – he’s struggling with some health issues. But I see his wife quite often. I think we need much more of “how to respond respectfully” these days. Our Lord was a carpenter and ate with sinners. His first followers where fisherman. I don’t know about your pastor but in one version of the story when Christ sent out the apostles to preach he told them to take nothing with them, not even to wear sandals. Something to keep in mind. Yes, if Jesus had walked in dressed as a carpenter, he might have received the same sort of looks and whispers.